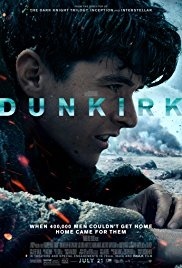 Dunkirk is the most Nolan-y Christopher Nolan film in the best way possible: it's an epic adventure that messes with time, it's soulless it's treatment of its characters, and there's no women in it (Nolan is notoriously horrible at portraying three-dimensional female characters in his films). The day Mark Rylance and company boat across the English Channel and the hour Hardy and Lowden's character are intercut with the week long journey Tommy, George, and Alex have trying to get off of the beach to form one cohesive story. The major complaint I've heard about the film is that they felt this was a cheap narrative trick that Nolan used, but I felt it was used effectively so we got a full character arc from all three story lines across the entirety of the film. Nolan is masterful at softening the narrative tricks directors use to tells stories on film, that I wonder if people just like knowing the trick ahead of time. Ultimately, Dunkirk is about the helpless and sense of nihilism that these solider felt while stranded in enemy territory. These men were stranded on this beach in Nazi-occupied France with nowhere to turn to for survival. Christopher Nolan immediately dove right into the action and slowly pressed down the gas pedal until you were left speechless by the end. By continuing to film in IMAX and to use practical stunts over computer animated, Nolan continue to proves that he's the modern-day Steven Spielberg that churns out superb blockbuster after superb blockbuster. I loved the spectacle of Dunkirk, I loved the vision of Dunkirk, and I loved the film making of Dunkirk. Basically, I loved Dunkirk.